If you enjoy knitting with cotton or wool yarn, then you know how frustrating it can be to wash your knitted crafts only to discover that they have shrank in the wash. One way to prevent shrinkage is to block the knitting, effectively causing the knitting to become locked into place. For example, you can make a hand-knitted scarf then block it to make sure that the scarf does not turn into a doll's scarf when it is washed. Fill a dish pan with very hot water. Mix in 2 Tbsp. of liquid dish soap. Place the hand knitted scarf into the hot, soapy water. Allow the scarf to remain in the water for five minutes. Place a towel onto a sheet of cardboard. 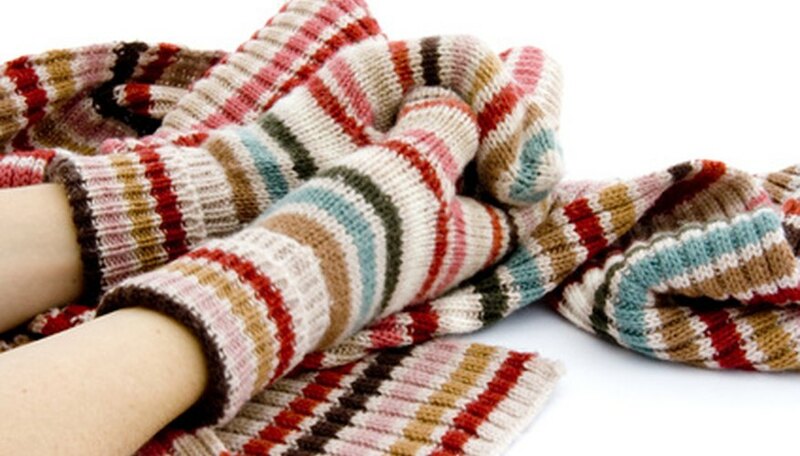 Squeeze out the knitted scarf, and lay it onto the towel. Flatten out the scarf in the form that you want it to remain in, and pin the edges of the scarf using T pins. Push the pins into the towel and cardboard to secure the scarf. Allow the scarf to dry completely.